Aerosol particle counters are built to rapidly count and size contaminant particles in cleanroom air and other controlled environments. Users tend to see this equipment as simply a device which, when the appropriate button is pressed, absolute results tumble out. However, it is important to be aware of the technology within the instrument in order to understand the relevance of the data generated and to put the operation of particle counters in context. When measuring very small quantities of anything, it is important to understand the operational technology, its benefits and its limitations. No measurement is absolute, all is relative to the measuring technique employed. 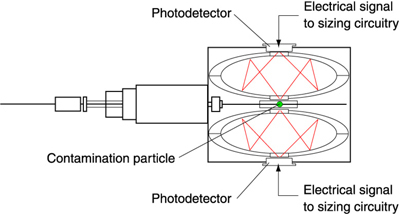 For example, if particles are measured by another technology, say, a scanning electro microscope, we would not be surprised to get slightly different results, we might even get surprisingly different results at certain sizes because that particular technology is producing a response which differs from that produced by the particle counter. Particles exist in a tremendous range of sizes, shapes and compositions, for example from within the cleanroom we could possibly measure, flakes of skin, small pieces of silicon or metal or fungal spores. The sources can be very broad. The size of particles is measured in micrometers (i.e. microns or µm), which is a millionth part of a metre (or a thousandth part of millimetre). In ‘state of the art’ semi-conductor industry facilities we are now measuring in nanometres, which is 10–9 metres, (or a millionth part of a millimetre). 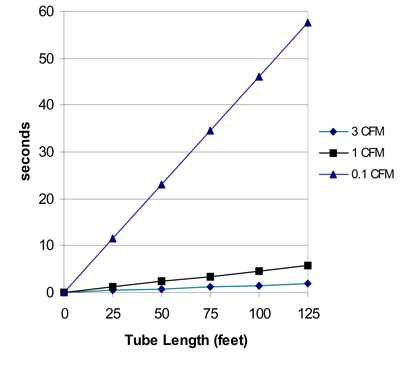 However, most people reading this article are probably more interested in the 0.5 and 5µm particles which are so relevant to the pharmaceutical, healthcare and medical device industries. To put size into perspective, visible particles are around 50µm, (a human hair, for example, would be 50 –150µm), non visible particles such as bacteria, are somewhere between sub 1 and 15µm, with plant spores and pollens falling between the visible and non visible at around 10 to 100µm. Most real life particles are non-uniform in structure, and this therefore poses the question of how to qualify the size? Ask people from industry “How would you size a particle?” and some would say it is based on the longest length, others the volume, and some an equivalent hole size through which a particle could pass. There would be many different answers and it is probably fair to say that none of them would be wrong, provided that they are qualified. Particle counters size particles by matching a signal response generated by the contaminant particle to an equivalent size of latex sphere. Users often look at the size/number distribution reported by an instrument and treat this data as absolute without recognising that there are a number of variables operating i.e. physical properties, refractive index, orientation etc., that will play a part in the size indicated (and therefore the size channel in which the particle is counted). Aerosol Particle Counters are calibrated for size by sampling known size monodispersed (i.e. single size) polystyrene latex spheres (PSLs) nebulised into the flow of HEPA/ULPA grade filtered air. The instrument is adjusted for each test particle size used and a calibration curve generated within the instrument. The sizing response from real life particles is therefore referenced by the instrument as an equivalent to a perfectly spherical latex sphere and counted in one particular size range (or channel). Any mis-sizing could therefore affect not only the stated size but also the size channel into which the particle is allotted, thereby affecting the number distribution. All the commonly used cleanroom airborne particle counters, regardless of manufacturer, work on a light scattering principle. Essentially, this means that they utilise a very bright light source to illuminate the particles. Nowadays this source is a laser diode; previously gas lasers and ‘white light’ halogen bulbs were used. This very bright light source shines through an optical block. Within the optical block are mirrors and one or more photo detectors. Sampled air is drawn through the laser beam by a small vacuum pump. As entrained particles in the air pass through the laser beam, the laser light interacts with particles and is scattered. The term ‘scattering’ means that the light undergoes a directional change. This change occurs in all directions: forwards, backwards and sideways. The red lines in diagram show this (see figure 1). The clam shapes in the diagram are mirrors. They are silvered so that the reflecting surface is inside. As the light scatters, it is picked up by these mirrors, which focus the scattered light on to one or more photo-detectors. The photo-detector converts the burst of light energy from each particle into a pulse of electrical energy. By measuring the height of the signal and referencing it to the calibration curve we can determine the size of the particle, and by counting the number of pulses we can determine quantity. So it is relatively straightforward from that point to allocated particle numbers into size channels. 1. Reflected light – when a light hits a particle and is angularly deflected. 3. Diffracted light – where the light comes close to the particle and is bent around it. There may also be a degree of absorption when a percentage of the light energy is retained by the particle and in some instances effects such as phosphorescence may occur from some particles types. Therefore, the whole term ‘scattering’ is made up of different physical properties relating to light, and the interaction of light and particles. The interaction of light and particles therefore depends, essentially, upon the particle composition, its refractive index and the difference between that particle and the background medium, (i.e. in the case of a cleanroom particle counter, air). In operation, the instrument compares the response it is getting from the particle signal to the calibration curve generated with latex spheres. What the instrument is actually doing is comparing the response from the interaction of that particle and the laser light and then relating that, not to some irregular particle of unknown morphology, but to a latex sphere in a background of air. So the instrument itself is not counting and sizing particles, it is counting and sizing flashes of light and relating them to a similar response from latex in air. Therefore users should be aware that particles with different scattering responses will size either smaller or larger relative to the latex standard. For example, a silicon particle, because of its high reflectivity (relative to the latex standard) is going to scatter a great deal of light, therefore a particle of this material will size large. A particle that absorbs light or doesn’t scatter very much light, possibly a particle generated from a heat source, it is going to size small relative to the latex standard. Therefore we are not looking at absolutes here. These sizing differences (from the latex standard) may possibly assign the particles into larger or smaller size channels. The orientation of the particles when passing through the laser beam will also have an effect on how it is sized. In an extreme example, if we sampled a rod-shaped particle which passed through the optical block so that the full length is exposed to the laser beam, the light would strike the largest surface area and scatter a relatively large amount of light. If it went through the laser beam end on, it would scatter from the smallest cross sectional area so that would size as a small particle. What particle counters do very well is to allow users to take instantaneous samples and get a very good real time indication as to the loading of particles in a room or around a critical process. Alternative methods, such as using a filter, pump and microscope, are time consuming, subjective and labour intensive. This type of instrumentation has been, and is, crucial and beneficial in the development, operation and advancement of cleanroom production environments. It is fast, well defined and non-subjective, and modern instruments are now extremely stable, robust and simple to use. However, the ease of operation should not cloud the user’s appreciation of how the instruments operate and the actual meaning of the data that is generated.